Marcelo is a Brazilian DXer who currently lives in Auckland, New Zealand. 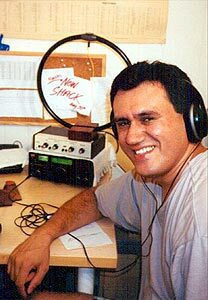 Marcelo has been in DXing since 1978 when at age of 13 he got a portable Telefunken receiver from his aunt. From 1980 to 1983 he spent most of his free time hunting stations on tropical bands especially from African and Asian countries. Most of his QSLs were obtained during that period of time. After a brake of 6 years due to college, Marcelo restarted in the late 80's with new receivers, a Grundig Satellite 2000 and a Yaesu FRG 7700. In early 90's he spent most of his time and effort listening and QSLing utility stations. In 1993 he became one of the coordinators of DX Clube do Brasil. While living in New Zealand for the first time between 1995 and 1997, Marcelo had a chance to meet several New Zealand DXers and participate in the 1995 annual convention that took place in North Auckland. Even though with a small receiver (Sony ICF 7600DS) he was able to do some great DX with South Pacific stations. Marcelo moved to USA in January 1999 and worked as a computer help desk specialist in the busy New York financial district. Now back in New Zealand, Marcelo is working on the freight forwarding industry as an ecommerce support specialist since 2004. Marcelo is equipped with a JRC NRD-545D, and has been concentrating his efforts mainly on tropical band and mediumwave DXing. He also participates actively in several DX Clubs around the world. By May 2002 he had heard 173 NASWA radio countries and received 422 QSLs from 128 radio countries. Marcelo can be reached via email at dxnz@ihug.co.nz.